Anyone who regularly reads this blog knows that I love my Farm Fresh Delivery. The business as a whole has only improved over the past few years and I love the fact that they now send out an e-newsletter each week with stories about their products, food information and you know it, recipes. The recipe below is directly from the enewsletter from Farm Fresh Delivery. Even though I forgot to purchase the peanut sauce, substituted tofu for the chicken, and didn’t use any radish, it was still a tasty dish and a much healthier and cost-effective alternative to ordering it as take-away from a nearby restaurant! Heat oil in a large skillet and brown ground turkey. Add garlic and ginger and saute briefly. Add Kentuckyaki sauce and simmer for 10 minutes while preparing vegetables. Place filling and vegetables in center of a large platter, then surround with lettuce leaves. Serve with peanut vinaigrette for dipping. Serves 4. YUMMY! I LOVE ANY SORT OF LETTUCE WRAPS! I think I’ll give this a try this week! THx! What a great recipe! 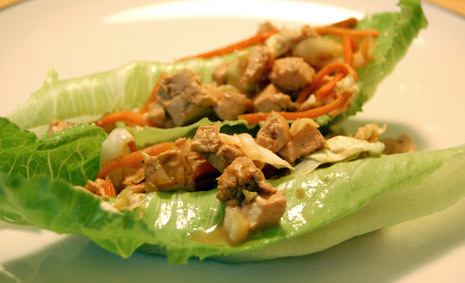 We love lettuce wraps in our house; they’re always a hit with the kids. I haven’t heard of the Kentuckyaki, but I’ll see if I can find some. Thanks!